Eyes Wide Shut . . . The liturgy as a whole is not favorable to exuberance of feeling. Emotion glows in its depths, but it smolders merely, like the fiery heart of the volcano, whose summit stands out clear and serene against the quiet sky. The liturgy is emotion, but it is emotion under the strictest control. Handed Over . . . 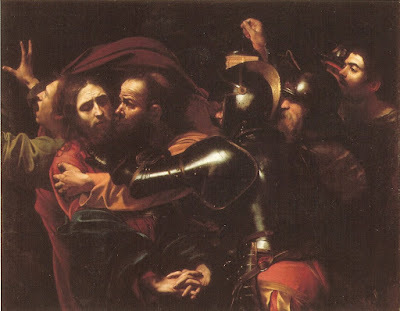 In Caravaggio's "The Taking of Christ" there are four depictions of hands: in the upper left, the hand of panic; below and slightly to the right of that, Judas' hand clutching Christ; above and to the right, the hand of the artist himself (holding a lantern as though holding a paintbrush); and at the center of the painting at the bottom, the hands of Christ who -- as he is being "handed over" to those who will torture and kill him -- has already handed himself over to the Father in whom he has complete confidence. As T. S. Eliot famously said: "Again, in spite of that, we call this Friday good." While the United Church of Christ is handing out condoms at church on Sunday, confident that "condoms are a sign that people of faith take sexuality seriously," certain well-placed Episcopalians -- eager not to let their liberal preeminence be eclipsed by low-church congregationalists -- have responded. The Episcopal Divinity School in Cambridge, Massachusetts has announced the appointment of Katherine Hancock Ragsdale as the school's sixth president and dean. I want to thank all of you who protect this blessing – who do this work every day: the health care providers, doctors, nurses, technicians, receptionists, who put your lives on the line to care for others (you are heroes — in my eyes, you are saints); the escorts and the activists; the lobbyists and the clinic defenders; all of you. You’re engaged in holy work. We've Come a Long Way . . .
Until the Anglican Lambeth Conference in 1930, there was an unbroken and unanimous Christian opposition to artificial birth control. That year the Lambeth Conference declared artificial birth control methods licit in limited situations. We've come a long way in a very short period of time. Making condoms available at houses of worship and faith-based educational settings provides opportunities to open conversations that can save lives. In this context, condoms become educational tools. Their presence encourages questions and discussions with individuals who are prepared to respond with factual and up-to-date information. Condoms are a sign that people of faith take sexuality seriously as a part of human life and that we endorse all options for preventing HIV infection and other sexually transmitted diseases. "Condoms are a sign that people of faith take sexuality seriously . . ."